Looking for fun things to do in New York at a low cost. There are a lot of places open to everyone without having to spend a single dollar. But be aware, however, some of these museums or venues are not "free" every day. ├ Are you looking for more places with free admission? In this section, I will show you the places that you can visit for free all year long. Hours: 9am to 5pm from Monday to Friday. Address: 132 W 138th Street between Malcolm X Boulevard (Lenox Avenue) & Adam Clayton Powell Jr. Boulevard (7th Avenue), New York, NY. Hours: 10am-4pm Tuesday to Saturday, from March to October. Address: Duane Street between Broadway & Centre Streets, behind 290 Broadway, New York, NY. Hours: 9am to 8pm from Monday to Friday, 11am-5pm on Saturday. Address: 536 LaGuardia Place, between 3rd & W Blecker streets, New York, NY. Hours: 11.30 am to 7pm from Tuesday to Thursday and Saturday; from 12pm to 7.30pm on Friday; from 12pm to 6pm on Sundays (closed Mondays). Address: 45 W 53 Street between Fifth and Sixth Avenues, New York, NY. Hours: 10am-5pm Tuesday to Sunday. Address: Malcolm X Boulevard (Lenox Avenue), 110th Street, New York, NY. Hours: Memorial Visitor Center is open from Wednesday to Sunday from 9am to 5pm. Address: Riverside Drive and 122nd Street, New York, NY. Address: Belvedere Castle, Midpark, 79th Street Transverse Road, New York, NY. Hours: 10am to 4.30pm Tuesday to Saturday; 1pm-6pm on Sundays. Address: Audubon Terrace Broadway between 155th & 156th street, New York, NY. Hours: daily from 7.45am to 5pm or 7pm depending on the season. Address: 500 25th St, Brooklyn, NY. Hours: 12pm-8pm Tuesday to Friday, 10am-5pm on Saturday. Address: Seventh Avenue and 27th Street, New York, NY. Hours: daily from 10am to 5pm, closed on Thursdays at 8pm. Address: 1 Bowling Green, between State & Whitehall Streets, New York, NY. Hours: Tuesday, Wednesday, Saturday from 10am to 6pm; Thursday and Friday from 10am to 8pm, Sunday from 1pm to 5pm.. Address: 455 Fifth Avenue and 42rd Street, New York, NY. Hours: Monday and from Thursday to Saturday from 10am to 6pm, Thursday and Wednesday from 10am to 8pm. Closed on Sunday. Address: 515 Bd MalcomX and 135th Street, New York, NY. Hours: depending on the exhibitions and auctions. Address: 1334 York Avenue, 72nd Street, New York, NY. Hours: 6.30am-8.45pm every day, except during mass services. There are free tours at 10am (check the dates on the website, a financial contribution is accepted). Address: Fifth Avenue between 50th and 51th Streets, New York, NY. Address: Battery Park, South Street at Whitehall Street, New York, NY. Hours: daily from 6 am to 2 am, Friday and Saturday until 3.30am, it only costs the price of a subway ticket (included in Unlimited Metrocard). These activities and museums are not always free, but at least once a week, you can go there for free. Address: 725 Park Avenue and 70th Street, New York, NY. Free: on Friday mornings from May to October, weekdays during winter. Address: 900 Washington Avenue at Eastern Parkway, Prospects Heights, Brooklyn. 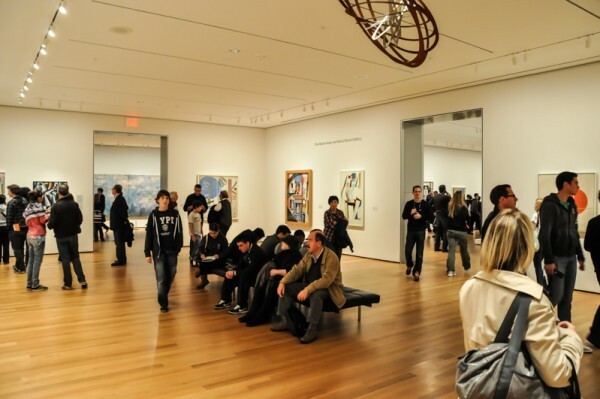 Free: the first Thursday of the month from 11am to 9pm. Address: 2nd Floor, 70 Mulberry Street and Bayard Street, New York, NY. Free: every Friday from 4pm-10pm (UNIQLO nights). Address: 11 West 53rd Street, New York, NY. Free: every Friday from 4pm to 8pm.. Address: 35th Avenue, 36th Street Astoria, Queens. Address: 2900 Southern Blvd., Bronx, NY. Free: Friday from 2pm to 5pm and Sundays from 10am to 11am. Address: 47-01 11th Street and 47 th Avenue, Flushing meadows-Corona Park, Queens. Free: Every Sunday (thanks to Target). Address: 144 W 125th Street between Malcolm X Boulevard and Adam Clayton Powell Jr. Boulevard, New York, NY. Free: Tuesdays and Saturdays from 9am to 12pm. Address: W 249th Street and Independence Avenue, Bronx, NY. “Pay as you wish” locations. Don’t get confused "pay as you wish” does not mean, "free". The places listed work with the system of "pay as you wish" every day of the week or certain days of the week. Hours: daily from 10 am to 17:45. RP: $23 for adults, $18 for seniors and students, $12.50 for children under 12 years. Address: Central Park W and 79th St, New York, NY. Hours: 11am to 6pm on Wednesday and Friday to Sunday; Thursday from 11am to 6pm; closed Monday and Tuesday. Price: $ 16 for adults, $ 10 for more than 62 years, free for children under 19 years. Free: every first Saturday of the month (Target First Saturdays) from 5pm tp 11pm. Address: 200 Eastern Parkway at Washington Avenue prospects Heights, Brooklyn. Hours: each gives what he or she wants to Thursday from 17h-20h. Cost: $18 for adults, $12 for over 65, free for 18 years or younger from Monday to Sunday from 11am to 5.45pm; closed on Wednesdays. Address: 1109 Fifth Avenue and 92nd Street, New York, NY. Hours: daily from 12pm to 6pm from Monday to Thursday, closed on Tuesdays and Wednesdays. RP: $10 for adults, $5 for seniors and students, free for children under 16 years. Address: 22-25 Jackson Avenue, Long Island City, NY. Hours: each gives what he wants to Thursday between 18h and 20h (KLM Thursdays). Rates: $16 for adults, $14 for seniors, $12 for students Tuesday to Sunday from 10am to 6pm; Thursdays and Fridays from 10am to 9pm. Address: 40 W 53rd Street, between 5th and 6th Avenues, New York, NY. Hours: Tuesday, Thursday, Friday, Saturday from 11am to 6pm; Wednesday 11am-9pm; Sunday from 1pm to 5pm. RP: $10 for adults, $5 for seniors and students, free for children under 12 years. RP: $25 for adults, $17 for over 65, free for children under 12 years. Entry to the MET includes a visit to The Cloisters and gardens in the same week. Address: 1000 Fifth Avenue and 82nd Street, New York, NY. Do you want even more places with free admission? There are other places in New York where you can get in for free or running the system of "pay as you wish", you can see them all here.